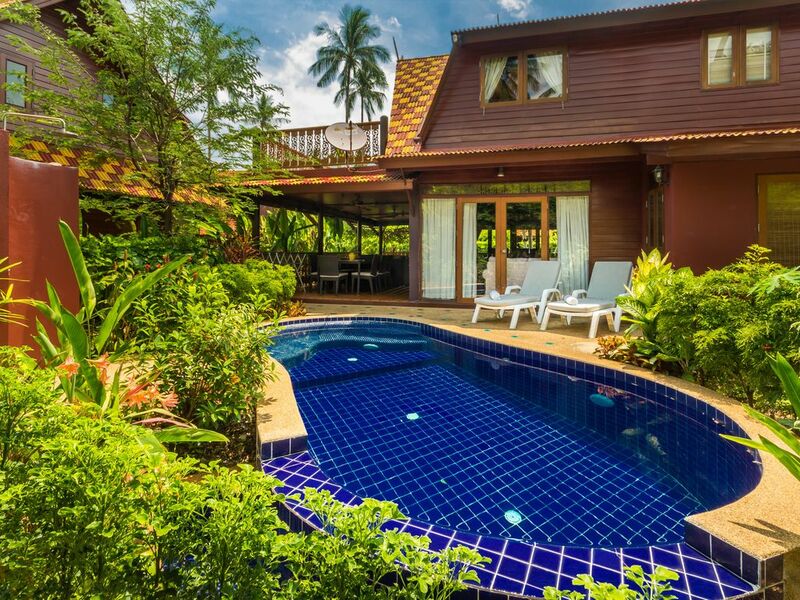 This spectacular 2 storey Thai style teak wood villa is set in its own tropical garden and beautiful sunsets can be seen from the terraces in the evening. The villa is perfect for families as it consists of one twin and 3 double bedrooms.The villa is fully air conditioned and has stylish, comfortable interior. It is equipped with TV, DVD, stereo, western fitted kitchen. kettle, coffee machine, toaster, fridge, crockery, cutlery and glass wear, bed linen and towels are included as is WiFi service. Sited just 20 m from a white sand beach, the villa has its own dip pool and shares a modern communal pool with separate children's pool and whirlpool massage tub. The villa has 4 spacious bedrooms including a master suite with dressing room and private seaview terrace and features large shaded outside terrace with ample seating. There several local and seafood restaurants within walking distance. Terrific place for a quiet family holiday! The house and gardens are beautifully kept, and clean, as is the splash pool and shared pool. It takes about 2 minutes to get to the beach, which is also clean, and you have it to Yourselves. There are several great beach restaurants in easy walking distance, and small local shops for the necessities. Bigger shops at about 20 mins in both directions, using local bus that runs all the time and stops wherever you want. We (4 adults and 4 kids) spent 8 amazing days in this well decorated nice looking spacious Thai villa. It's a very quiet place and pretty close to the beach. You have all the domestic appliance you need, 2 flat TVs, a collection of DVD movies, lots of Koh Samui travel guide materials, free WiFi, couple of umbrellas etc. It's extremely cozy place to be when it rains or during storm. If you need a massage, you can call a massage lady, which serves the Coconut Paradise resort. Cost - 350 baht/thai massage. There is one thing I'd like to point at - you will definitely need a bike or a car in order to go shopping or to feel the urban life again. Kids just loved villa and so did we. Drei wunderbare Wochen zum entspannen, baden, lesen, reden und die thailändische Küche geniessen. Haus: gut gelegen, ruhig (bei Nacht gelegentlich Straßenlärm zu hören), wenige Schritte zum Strand direkt. Obwohl mehrere Unterkünfte in der Umgebung angeboten werden zählt dies Region nicht zu den den touristischen Schwerpunkten (für uns zum Glück). Die Ausstattung mit Klimaanlagen in jedem Zimmer war sehr angenehm (bei fehlenden Fliegengittern mussten wir die Fenster auch nachts geschlossen halten). Zimmer unterschiedlicher Größe - z.T. traumhaft, teils zufriedenstellend (bei zwei kleineren ist der obere Wandbereich offen zum Nachbarraum). Nicht ganz so optimal empfanden wir die Küchenausrüstung; wer selbst gelegentlich kochen will wird entsprechende Schüsseln vermissen, Besteck und Gläser reichen gerade für 4-6 Personen. Die Matratzen empfanden wir als zu hart. Die Haus-Maus hat sich offenbar bei uns wohl gefühlt. Ian, der Vermieter, war sehr entgegenkommend und alles lief problemlos und entspannt. Umgebung. Der direkte Strand vor dem Anwesen - mit insgesamt 9 einzelnen Villen - war sauber; im Meer einzelne größere Steine, die keine Probleme bereiteten. Unangenehmer waren relativ harte Wasserpflanzen, die bis in den näheren Strandbereich reichen und beim schwimmen eine unangenehme Barriere darstellen. 3-400 m Fußmarsch am Strand (teils durch einen Bereich mit Felsbrocken, die fast immer mit großem Schritt problemlos zu überwinden sind) lohnen: ein „Traumstrand“ belohnt für diesen ‚Ausflug‘: schöner, weisser Sandstrand, bei dem man weit auf‘s Meer schwimmen kann ohne von Pflanzen oder Riff beeinträchtigt zu werden. Essen und trinken in dieser Bucht möglich. Mehrere Restaurants in fussläufiger Entfernung mit teilweise phantastischer Küche. Zur Selbstversorgung sind einige kleinere Geschäfte in der Nähe; wer größere Einkäufe vor hat findet auch größere Supermärkte in ca. 10 km Entfernung (Taxi). Beach complex, Villa 20 m from beach in secure private resort complex, between Maenam and Nathon near Natural wing Resort on Samui ring round. Complex has mature garden and large communial pool with fine white sandy beach, many local restaurants nearby. Golf: There are 3 golf courses on the island. Santi Buri is 18 hole Championship course 5 km from resort. Royal Samui Sport and Social club is 9 hole course in hills with magnificent views 15 km from resort.